The short-lived 1992-93 incarnation of Deep Purple Mk 2 had as much of its own individual flavour as the two previous periods. They produced one of heaviest (though perhaps not one the best) reunion studio albums, and followed this up with a turbulent, but often brilliant, European tour. 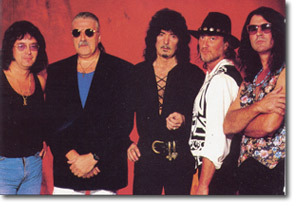 The return of Gillan did not meet with Ritchie Blackmore's full approval however, and lead to his final exit from the band in late 1993. Most fans were pleased, but surprised, to hear of Ian Gillan's return to the band, and with the band's 25th anniversary looming there was a definite feeling of relief. In the end they didn't make much play of the anniversary, which in any case was overtaken anyway by further upheaval within the band. 17th November: Ritchie Blackmore's last show with Deep Purple, Jäähalli, Helsinki. The aptly titled studio album 'The Battle Rages On' appeared in July 1993, containing tracks originally earmarked for Mk 5's abandoned second album. Aided by Roger Glover, Ian Gillan had put in a huge amount of work on the music, stamping it with his own identity. The result was the heaviest and most uncompromising Mk 2 reunion era album, which managed to transcend overly familiar guitar riffs in some songs. The band still packed a large enough punch for the album to come in at number 21 in the UK charts, but it was held back in the USA, where the original impact of the reunion had been dissipated. The Battle Rages On tour began in Europe in September. Ritchie Blackmore wasn't happy with Turner's departure, but the others discovered a new joy in playing together, a joy which has propelled the band right through to the present day. The tour produced many of the most intense and exhilarating Mk 2 reunion shows, with Blackmore largely channelling his anger and frustration into his playing, which reached unbelievable heights. However in late October 1993 Blackmore let it be known that he would be leaving after the European leg was completed in November. In his remaining shows he caused controversy by attacking an onstage camera crew in Birmingham, but did manage to leave the band on a high after particularly blistering performances in his final few shows. On leaving Deep Purple Blackmore initially formed a new line-up of Rainbow, but within a few years had ditched rock music altogether in favour of playing medieval folk / pop music as Blackmore's Night. The rest of Deep Purple were thoroughly reinvigorated by the tour, and determined to fulfil the December 1993 Japanese tour. For that to happen a guitarist of sufficient stature had to be found at short notice. With the help of promoter Mr Udo, American Joe Satriani stepped in and the next chapter of Deep Purple's career got under way. Completing the collection.... The cds of the albums listed above cover every officially released item from Deep Purple Mk 2's second reunion period. The Japanese (and American) editions of the Come Hell Or High Water CD contain bonus material - shortened versions of 'Lazy', 'Space Truckin' and 'Woman From Tokyo'. Less than ten minutes in total. 'The Battle Rages On' was supposed to be remixed for its American release, but no difference is noticeable. The Stockholm 13/11/93 show on 'New Live & Rare' lacks the encores from Copenhagen 12/11/93 which were included on the source bootleg ('In Your Trousers'). The two full shows from 'Live In Europe 1993' where later (briefly) released separately, with Birmingham being withdrawn after complaints in the media by Ian Gillan. Completing the collection.... The 'Come Hell Or High Water' DVD has only one track (Anyone's Daughter') which also appears on the CD version. The video / DVD has edits in 'Highway Star' and 'Black Night', and is missing 'Hush'. The DVD contains no additional material from the original 1994 video.